This was towards the end of the heating stage, and the temperature had been stable for some time. The Voltera software was showing a temperature setpoint of 210, with actual temperature moving around in the range 210-215. 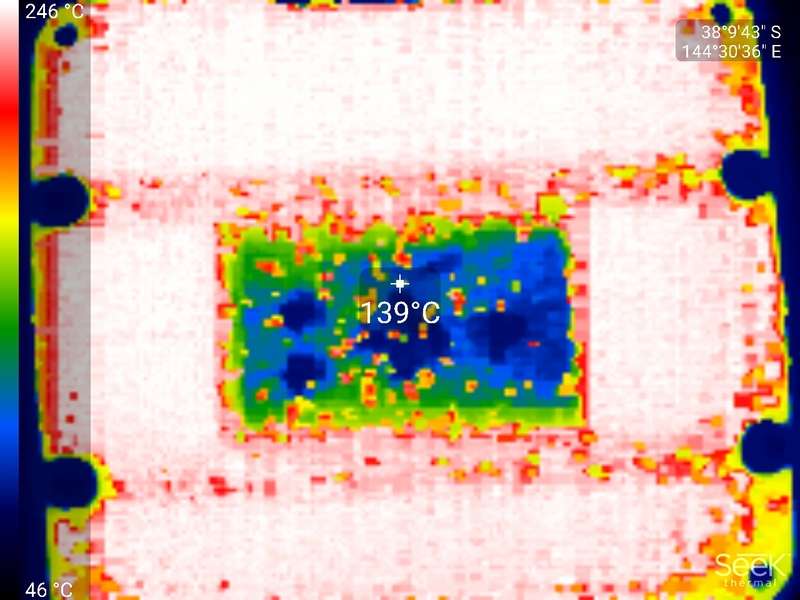 The IR camera said the heating plate (white area) temperature was 190-195C, which was confirmed by a separate point IR pyrometer. Ambient temperature was around 20C at the time. Thanks for posting this image @cborn! Because of where the temperature sensor is located on the heating plate, we’ve seen that the temperature will be somewhere between 10-20C lower when target is 210C, which seems to match up really well with what you measured here. To account for this difference, we typically set the target temperature about 20C higher than required - for example, the reflow profile peaks at 180 to hit a target 160C. This compensation is something we could try to bake in ( ) to the software, so that a temp setting of 210C would actually be 210C - it’s just something we haven’t had a chance to implement yet. @mewertow - It may be interesting to measure the temperature at the PCB surface facing the heated bed, to see what effect the insulation and air-pocket have, and also if there is much variation when baking large and small boards, as the larger ones will restrict heat flow out of the plate?